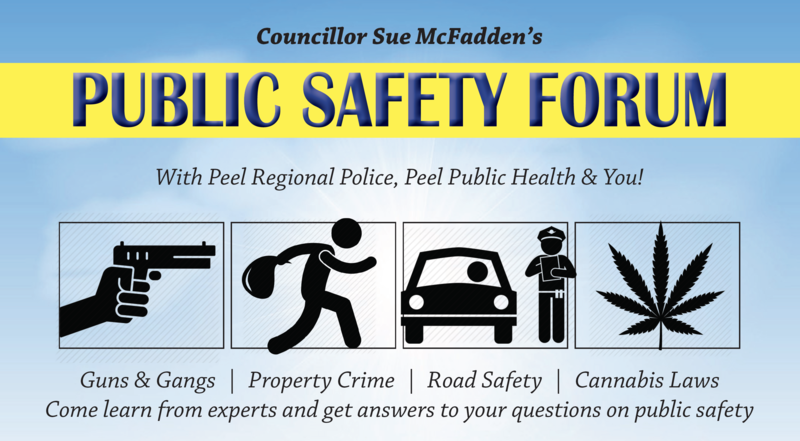 Councillor McFadden’s Public Safety Forum brings together experts in law enforcement and public health to present and answer your questions on issues related to the overall safety of our community. We invite you to bring general questions related to four topics being considered rather than questions about a particular act of crime against your personal property. Doors open at 6:30 pm. Come at that time for a complimentary slice of pizza from Panago Pizza! You will be able to attend two of the four break-out sessions to learn more about community safety. Between the two sessions, you can visit the tables of our partner organizations to find out more about crime prevention, traffic safety and more. Peel Crimestoppers, Safe City Mississauga, Traffic Safety Council, Peel Public Health and more will be exhibitors at this event. We are pleased to have Acting Chief of Police Chris McCord in attendance at this event! At the conclusion of the forum, valuable prizes will be given away to some lucky attendees. Following this forum, Ward 10 residents who have a passion for community safety and can make a positive contribution in this area can apply to serve on Councillor McFadden’s Public Safety Roundtable in order to continue this important dialogue with safety officials. Check back to this web site for the application, coming April 3rd. Street gangs are a concern as they scare and intimidate members of the community and can negatively influence and lure young people into the gang life. This is a problem as the intimidated community members are less likely to report gang-related crimes, such as theft, harassment, drugs, guns and human trafficking. In this session, find out about the state of gang activity in Mississauga, what the police are doing to prevent it, how gangs attract members and what the signs might be for people at risk. Bring your questions. On average, the cities of Brampton and Mississauga experience seven residential break and enters each day. Residential break-ins are typically crimes of opportunity, burglars typically target a certain property based on characteristics that will increase their chances of breaking-in without getting caught. Find out how you can make your home less attractive to theft and how you and your neighbours can work together for a safer neighbourhood. Bring your questions. Road safety is a priority to the public and a key objective for the Police. Officers are committed to improving road safety and pedestrian safety through education, enforcement and proactive strategies. Police enforce the Highway Traffic Act (HTA) in an effort to change dangerous driving habits and keep our roads safe. Find out how Road Safety experts use analytics to assist with investigations and to manage traffic safety concerns proactively. Bring your questions. The legalization of cannabis ushers in new and valid concerns about the health and safety of the general public – and especially our youth. The goal in this session is to provide the right information, so residents can better understand the health impacts of cannabis as well as the Government of Ontario’s new laws – what’s allowed and what isn’t. Find out how Peel Public Health and Peel Police will enforce these new rules to help keep our community safe. Bring your questions.